Mark’s work with Mile Cross Primary School, Norwich, helping to develop the quality of teaching, has reached the finals of the prestigious Chartered Institute for Professional People Management Awards. The category is Best L&D Initiative – Public/Third Sector category. Results will be announced at end of September. The desire to improve the quality and consistency of teaching in classes throughout the school so that attendance and progress/attainment could move the school on from an Ofsted inspection grading of ‘Good’ in Feb 2014. This was a drive for consistently high-quality teaching and learning for all children, regardless of which teacher they had. This desire was set within a context where expectations of schools from national government and Ofsted were rising year on year. Entwined with this objective was the school’s ambition to nurture a community of teachers who held high expectations for children, who were risk-takers, reflective and had a shared language for teaching and learning. 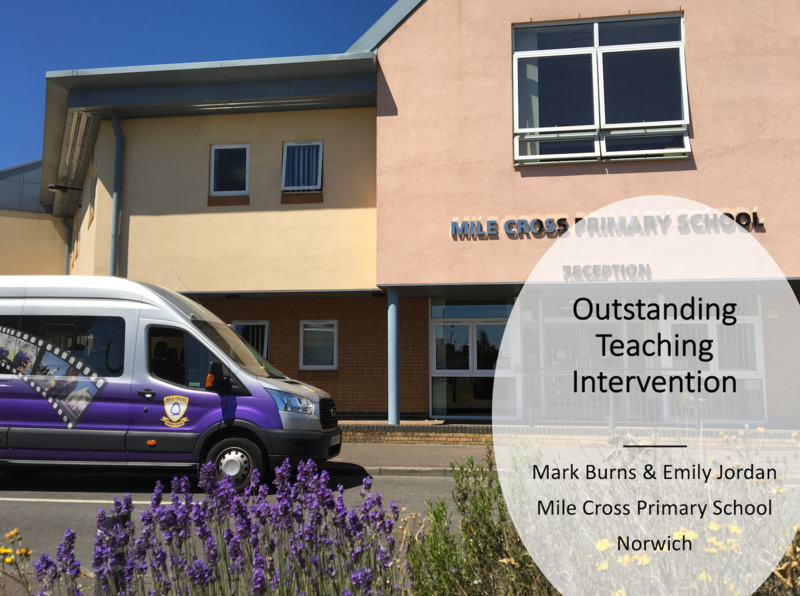 Mile Cross Primary School is a larger than average-sized primary school with nearly five hundred pupils and a staff of more than 60 teachers and teaching assistants working in classrooms daily. In a government study of deprived areas, Mile Cross is ranked in the bottom 2% nationally for deprivation. As a consequence, almost two-thirds of pupils are supported by the pupil premium (PP) funding. PP is additional funding to schools to support children from low income families. Over the course of two years, small cohorts of teachers took part in a series of intervention programmes that each lasted five months in duration. Over this period, all teaching staff and most middle/senior leaders took part. The programme had a three module structure led by an external course leader, Mark Burns. In each module there was a micro focus on one specific aspect of world class teaching, as evidenced by international research. The teachers worked through an iterative cycle of plan, test, reflect in each module. The teachers carefully planned their unique change journey based upon training. During this planning stage, there were structured opportunities for teachers to collaborate with their peers and to discuss and reflect on their teaching practise. The teachers then were given time to test the changes out in their classrooms ‘live’ with their classes. To support accurate reflection and to avoid perception gaps, the teachers were filmed testing the changes in their classrooms. This was significant as none had ever seen themselves teach before. The teachers then analysed their videos to assess the impact of the changes, before working individually with a coach who facilitated a reflective conversation about overcoming barriers to further growth. This dialogue enabled the teacher to refine their ongoing action plan to work on before the next module. There are three aims of the programme. First, to develop an accurate self-perception by teachers about their strengths and areas for further development based upon shared clarity and language about what outstanding teaching is. Second, to develop a community of teachers who see the value in collaborating, planning and reflecting together. Finally, to nurture a risk-taking culture where teachers continue to be learners about what they do, and as a consequence are committed to ongoing improvement in their teaching through taking risks in their classrooms. When the school was inspected by Ofsted in November 2017, it was awarded ‘Outstanding’ ratings across all aspects of the criteria. Ofsted commented in the report that ‘Teaching is outstanding because leaders invest heavily in training and supporting staff.’ and ‘Leaders have also invested heavily in high-quality professional development, ensuring that every teacher attends an extended course on becoming outstanding’. New staff joining the school were part of OTI cohorts, and Ofsted commented: ‘Support for those new to teaching is excellent. Newly qualified teachers learn very quickly and soon become as effective as much more experienced teachers’. 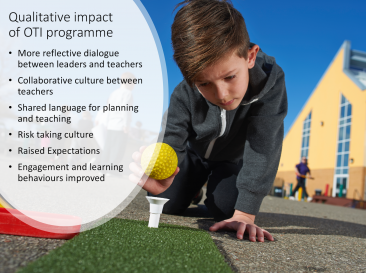 The leadership and teachers of the school have continued to maintain and use the shared language developed through the programme when they are co-planning, reflecting as well as when discussing lesson observations. They’ve seen the risk-taking culture that emerged through the programme being maintained. Staff aren’t scared of trying new ideas in their classrooms. The processes in the programme were designed carefully to overcome key barriers to learning for teachers at Mile Cross. The most important foundation for effective learning on this programme was building strong relational trust with the teachers. Due to the high accountability culture in school driven by the external Ofsted agenda, many teachers fear the reputational damage that comes with ‘making mistakes’ in their lessons. As a result, they tend to avoid the type of risks taking required for impactful learning. Johnny, a teacher at the school was typical in reflecting afterwards, ‘a crucial aspect was the ability to take risks and know that rich learning would come from it, whether it’s brilliant or a flop.’ By ensuring the process, including the videos and coaching conversations were confidential, teachers could work in a ‘safe’ learning environment where they could take risks as well as share their own gaps in understanding. This included them allowing videoing of their practise ‘live’, something that is still extremely unusual in schools. Teaching has become a high stress, heavy workload role in recent years in school. As a result, cognitive overload is a barrier to learning for many. The programme sought to manage this cognitive load in two ways. The first was to have a micro focus for each module. As a result, the teachers’ thinking and testing was focussed on one area at a time. This prevented teachers being overwhelmed with change actions. Alongside this with providing processing time for teachers between modules, enabled them to embed the changes into their day to day habits. The second way the programme sought to manage cognitive load was to create shared clarity and language about what ‘outstanding teaching’ represented. This clarity played a key role enabling them to accurately calibrate their own starting points and de-mystifying their journey of improvement. The need to create shared clarity in the school was crucial to build open dialogue. Teachers spend most of their time working alone in rooms (albeit surrounded by children) without natural opportunities for ongoing dialogue with their peers. As a result, they develop their own, individual understanding of quality. The programme provided not just shared clarity, but practical tools and strategies that they could use in their classrooms. The personalised nature of the programme, through the coaching element, provided individuals with step change support, regardless of whether they were a high or low performer. The videoing of lessons, enabled the teachers to develop greater self-awareness of their teaching and the impact it had on children’s learning. Not only this, but the extent to which their inattentional blindness was hindering their improvement. Through each module, the teachers were incrementally able to build the knowledge, attitudes, skills and habits for improvement, applying the change process with their own classes. This overcame the huge limitation that traditional professional learning for teachers, largely focussed on one day training, suffers from. Only the knowledge aspect of teaching can be addressed in one day training. The other aspects can only be developed as part of applying and developing through application in the classroom. Something that culturally has been alien to most schools.